Barely a few days prior to Tom Ridge's spectacular announcement, a spokesman of Northern Command Headquarters at Patterson Air Force Base in Colorado confirmed that Northcom (which has a mandate to defend the Homeland) was "at a high level of readiness" and was proceeding with the (routine) deployment of jet fighters over major cities as well as the posting of troops at key locations (Atlantic Journal and Constitution, 3 July 2004). Meanwhile, the cancellation / rescheduling of elections issue is presented to public opinion as a mere technical question, as a means of "protecting democracy," in the case of a terror attack. CNN has asked people "to vote" on their website, on whether they think the elections should be held in the case of a terror attack. It all sounds very democratic. There is, however, evidence from police sources that at least two of these five high profile post-9/11 code orange terror alerts were fabricated: February 7, 2003, and December, 21, 2003. For details and documentary evidence, see http://www.globalresearch.ca/articles/CHO402A.html. There is also ample evidence that Al Qaeda is a creation of the US intelligence apparatus and that the terror network is supported by the Bush Administration. The most recent DHS announcement has all the appearances of yet another fabricated report of an impending attack by an illusive "outside enemy." It is already amply documented: Al Qaeda is a CIA sponsored "intelligence asset," and the disinformation regarding the terror attacks emanates out of US intelligence. Details of the police/intelligence investigation regarding Secretary Tom Ridge's July terror warning have not been provided. Officials have said the USG "does not have specific knowledge about where, when or how such an attack would take place," but the CIA, the FBI and other agencies are said to be "actively working to gain that knowledge." "at each threat condition [yellow, orange, red], federal departments and agencies would implement a corresponding set of 'Protective Measures' to further reduce vulnerability or increase response capability during a period of heightened alert." Supported by a barrage of media propaganda, these repeated terror alerts have created an environment of fear and intimidation, a wait-and-accept attitude, a false normality. US citizensare led to believe that a military solution is required to protect democracy. What the US public is not aware of, is that a code red alert suspends civilian government; it triggers a whole series of emergency procedures; it is tantamount to a coup d'etat -- although in many regards the coup d'etat has already taken place under the post-9/11 anti-terrorist legislation and the rigging of the 2000 elections which brought George W. Bush intothe White House. Homeland Security (DHS) has in fact been contemplating a code red alert "scenario" -- using Al Qaeda as a pretext -- for more than a year. In May 2003, the DHS conducted a major "anti-terrorist exercise" entitled TOPOFF 2. The latter was described as "the largest and most comprehensive terrorism response and homeland security exercise ever conducted in the United States." The exercise was based on code red assumptions involving a simulated terrorist attack. See: http://www.globalresearch.ca/articles/CHO402A.html. A code red alert, according to the Federal Emergency Management Agency (FEMA), would create conditions for the ("temporary" we are told) suspension of the normal functions of civilian government, implying the cancellation or postponement of federal and State elections. Northern Command would take over. Several functions of civilian administration would be suspended; others could be transferred to the jurisdiction of the military. More generally, the procedure would disrupt government offices, businesses, schools, public services, transportation, etc. A secret "Shadow Government" under the classified "Continuity of Operations Plan" was installed on September 11, 2001. (See: http://www.washingtonpost.com/ac2/wp-dyn/A205842002Feb28?language=printer ). Known internally as "Continuity of Government" or COG, the secret shadow government would become functional in the case of a code red alert, redeploying key staff to secret locations. Code red alert would trigger the "civilian" Homeland Emergency response system. The latteris already in place including DHS Ready.Gov instructions, the Big Brother Citizen Corps, not to mention the USAonWatch or Neighborhood Watch Program which has a mandate to "identify and report suspicious activity in neighbourhoods" across America. In practice, the Posse Comitatus Act is dead (see Frank Morales at http://globalresearch.ca/articles/MOR309A.html ). The existing legislation inherited from the Clinton administration, not to mention the post 9/11 Patriot Acts I and II, "blurs the line between military and civilian roles," it allows the military to intervene in judicial and law enforcement activities even in the absence of an emergency situation. The 1996 legislation allowed the military to intervene in the case of a national emergency (e.g., a terrorist attack). Clinton's 1999 Defense Authorization Act (DAA) extended those powers by creating an "exception" to the Posse Comitatus Act, which permits the military to be involved in civilian affairs "regardless of whether there is an emergency." See ACLU at: http://www.aclu.org/NationalSecurity/NationalSecurity.cfm?ID=8683&c=24. In other words, the Clinton era legislation had already laid the legal and ideological foundations of the "war on terrorism." "The new proposed exception to the Posse Comitatus Act would further expand a controversial measure adopted by Congress in 1996 that permitted military involvement in 'emergencies' involving chemical and biological weapons crimes. "Under that new measure, which was proposed by the Defense Department, the military would be authorized to deal with crimes involving any chemical or biological weapons -- or any other weapon of mass destruction -- regardless of whether there is an 'emergency.' In addition, the new proposal would lift requirements that the military be reimbursed for the cost of its intervention, thus likely increasing the number of requests for military assistance. "The defense authorization bill would also require the Pentagon to develop a plan to assign military personnel to assist Customs and the Immigration and Naturalization Service to 'respond to threats to national security posed by entry into the U.S. of terrorists or drug traffickers.'" Despite this 1999 "exception"" to the Posse Comitatus Act, which effectively invalidates it, thePentagon and Homeland Security, anxious to remove all ambiguities, are nonetheless actively lobbying the US Congress for the outright repeal of the 1878 legislation. "It is time to rescind the existing Posse Comitatus Act and replace it with a new law... The Posse Comitatus Act is an artefact of a different conflict-between freedom and slavery or between North and South, if you prefer. Today's conflict is also in a sense between freedom and slavery, but this time it is between civilization and terrorism. New problems often need new solutions, and a new set of rules is needed for this issue. In turn, the Bush administration Patriot Acts have set the groundwork of a police state. In minute detail, they go much further in setting the stage for the militarization of civilian institutions. The various provisions are very detailed and precise. The USA PATRIOT ACT of 2001 entitled "Providing Appropriate Tools Required to Intercept and Obstruct Terrorism Act of 2001" as well as the "Domestic Security Enhancement Act of 2003," (PATRIOT Act II) create the conditions for the militarization of justice and police functions. The creation of Northcom is consistent with the de facto repeal of the Posse Comitatus Act. In fact, the position of a "Homeland Defense Command" leader "in the event of a terrorist attack on U.S. soil," had already been envisaged in early 1999 by Clinton's Defense Secretary William Cohen. (http://www.thirdworldtraveler.com/Civil_Liberties/Posse_Comitatus_Law.html ). 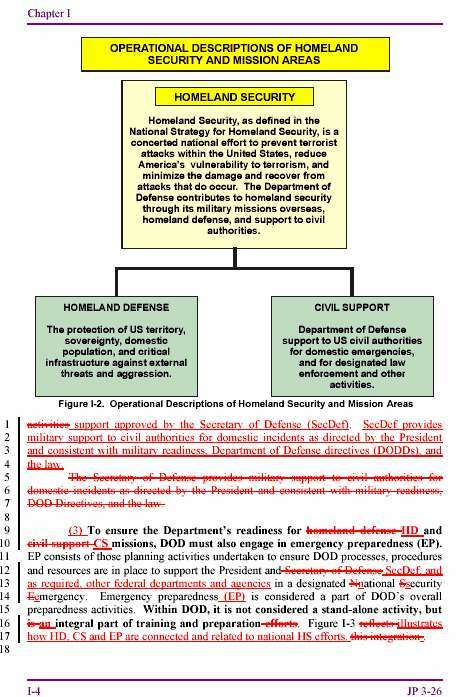 The role of Northern Command is defined in the Pentagon's "Joint Doctrine for Homeland Security (JP-26)." The latter constitutes a blueprint on how to defend the Homeland. Even inthe case where the enemy is fabricated, and this is known at the highest levels of military-intelligence, a military coup d'etat would become operational in terms of the detailed command military/ security provisions contained in this document (click here to consult JP-26). According to Frank Morales,"the scenario of a military take-over of America is unfolding." And Northern Command is the core military entity in this takeover and militarization of civilian institutions. Northcom has what David Isenberg describes as "a Creeping Civilian Mission." Since its inception, it has been building capabilities in domestic intelligence and law enforcement1. It is [through the DoD] in permanent liaison with the DHS and the Justice Department2. It has several hundred FBI and CIA officers stationed at its headquarters in Colorado. It is in permanent liaison, through an advanced communications system, with municipalities and domestic civilian law enforcement agencies around the country3. (See Isenberg, op. cit.). Meanwhile the CIA, which has a unit operating out of Northcom, has extended its mandate to issues of "domestic intelligence." According to Homeland Security Secretary Tom Ridge (22 December 2003): "If we go to [code] Red ... it basically shuts down the country." In which case, a national emergency is declared. Northern Command deploys its forces on air, land and sea. Several functions of civilian government are transferred to Northcom headquarters, which already has the structures which enable it to oversee and supervise civilian institutions. The jurisdiction of the Northern Command now extends from Mexico to Alaska. Under ("bi-national") agreements signed with neighbouring countries, Northern Command can intervene and deploy its forces and military arsenal on land, air and sea in Canada (extending into its Northern territories), throughout Mexico and in parts of the Caribbean. Taken together, the existing legislation grants the military extensive rights to intervene in any "emergency situation," in practice, without the prior approval of the Commander in Chief. US intelligence is not only involved in creating phony terror warnings, it is also firmly behind the terror groups, providing them with covert support. This ongoing militarization of America is not a project of the Republicans. "We could blow up a U.S. ship in Guantanamo Bay and blame Cuba," "We could develop a Communist Cuban terror campaign in the Miami area, in other Florida cities and even in Washington" "casualty lists in U.S. newspapers would cause a helpful wave of national indignation." (See the declassified Top Secret 1962 document titled "Justification for U.S. Military Intervention in Cuba"16 (See "Operation Northwoods" at http://www.globalresearch.ca/articles/NOR111A.html ). Both "the war on terrorism" as well as the domestic war on terrorism are consistent, from the point of view of military planning, with the logic of Operation Northwoods. Civilian casualties are used as "a war pretext incident," to galvanize public support for a military intervention. "a large-scale attack in the United States in an effort to disrupt our democratic process." What we are not told is that Al Qaeda is a creation of the CIA, and that Al Qaeda remains a US sponsored "intelligence asset." More recently, General Franks, the CENTCOM general who led the military campaign into Iraq, pointed in an October 2003 interview to the role of what he called a "massive casualty-producing event." (See "General Tommy Franks Calls for Repeal of US Constitution" November 2003, http://www.globalresearch.ca/articles/EDW311A.html , see also http://www.globalresearch.ca/articles/CHO402A.html). This statement, from an individual who was actively involved in military and intelligence planning at the highest levels, suggests that the "militarization of our country" is an ongoing operational assumption. It has become part of the broader "Washington consensus." It is a "talking point" not only in the corridors of the Pentagon, Langley and Homeland Security, but also in the mainstream media. Some people think that a change in direction will occur if the Democrats win the 2004 presidential elections. Yet the Democrats are not opposed to the illegal occupation of Iraq and Afghanistan. Nor are they opposed to the militarization of civilian institutions, as evidenced by their initiative to repeal the Posse Comitatus Act. While there are substantive differences between Republicans and Democrats, Bush's National Security doctrine is a continuation of that formulated under the Clinton Administration in 1995, which was based on a "strategy of containment of rogue states." In Fall 2003, the Democrats released their own militarization blueprint, entitled Progressive Internationalism: A Democratic National Security Strategy. It calls for "the bold exercise of American power, not to dominate but to shape alliances and international institutions that share a common commitment to liberal values." The militarization of America is a project of the US corporate elites, with significant divisions within the corporate establishment on how it is to be achieved. The corporate establishment, with its associated think tanks and semi-secret societies (The Bilderberg, Council on Foreign Relations, Trilateral Commission, etc. ), is by no means monolithic. While the US Congress and the bi-partisan consensus constitutes the facade, the Military (and their Intelligence counterparts) are, from the point of view of the corporate elites, mere foreign policy "pawns," to use Henry Kissinger's expression, acting on behalf of dominant business interests. The Wall Street financial establishment, the military-industrial complex led by Lockheed Martin, the big five weapons and aerospace defence contractors, the Texas oil giants and energy conglomerates, the construction and engineering and public utility companies including the biotechnology conglomerates, are indelibly behind the militarization of America. While a coup d'etat triggered by a code red alert is a distinct possibility in the months ahead, we must understand that the militarization of civilian institutions in America is an ongoing process. The coup d'etat entrenches the militarization process. It suspends civil liberties and the antiwar movement outright. It makes any form of reversal back to civilian forms of government much more difficult to achieve. Militarization, however, as distinct from an outright military coup d'etat, does not exclude the electoral process. Under a Kerry-Edwards administration, the military-intelligence apparatus - which constitutes the backbone of the "war on terrorism" and of the police state - would remain functionally intact. So would Northern Command and the various Big Brother functions of the Department of Homeland Security. extensive war crimes and the blatant violation of international law. On the economic front, we can expect militarization to accelerate the gamut of neoliberal economic reforms both nationally and internationally (in the later case, they would be implemented under the auspices of the IMF, World Bank and World Trade Organisation). Militarization will be accompanied by a new deadly wave of privatization of public services, urban infrastructure would be transferred to private companies, local economies including small scale enterprises and agriculture would be further destabilized and deregulated, etc., leading to increased levels of unemployment and the impoverishment of millions of people. Militarization is an integral part of the neoliberal agenda. The Centre for Research on Globalization (CRG) at www.globalresearch.ca grants permission to cross-post original CRG articles in their entirety, or any portions thereof, on community internet sites, as long as the text and title of the article are not modified. The source must be acknowledged as follows: Centre for Research on Globalization (CRG) at www.globalresearch.ca . The active URL hyperlink address of the original CRG article and the author's copyright note must be clearly displayed. For articles from other news sources, check with the original copyright holder, where applicable. For publication of CRG articles in print or other forms including commercial internet sites, contact: [email protected]. 1"As DoD reorganizes the civil support mission, it should consider carving out a significant role for NORTHCOM in the planning, training, and day-to-day management of operations. This would allow the assistant secretary to focus more of his primary effort on policy issues, a more appropriate role for the secretariat than managing field operations. In addition, placing NORTHCOM in the routine business of coordinating these missions, even when a large federal military presence is not required, will allow the command to establish solid working relationships with the other federal agencies and state and local governments with which it will have to work intimately in responding to a large-scale disaster or terrorist attack. Placing NORTHCOM in the routine civil support chain of command will help its staff develop trust and confidence with other agencies. This will be needed to operate effectively under the stressful demands and pressing time-constraints of a major national response. In particular, expanding NORTHCOM's responsibilities for planning support for a range of operations, such as preparation for the annual forest fire season where military forces support state fire fighting missions, might provide important dividends in preparing to respond to more dramatic future tasks." 3"NORTHCOM has the primary mission of 'homeland security' with a focus on coordinating with local, state, national and international agencies rather than commanding large combat forces as the other nine unified commands do. It will undertake the land, aerospace and sea defense of the continental United States, as well as command U.S. forces operating in support of civil authorities on 'homeland security' tasks. It is located at Peterson Air Force Base, in eastern Colorado Springs, Colorado. Under NORTHCOM's jurisdiction are the continental U.S., Alaska, Canada and Mexico, plus two portions of the Caribbean, and the five hundred mile coastal area. NORTHCOM provides assistance to civil authorities when directed by the President or Secretary of Defense… Although the Department of Homeland Security has been created with Tom Ridge as its director, a functioning military 'homeland security' department is neatly tucked away inside NORTHCOM. The Joint Force Headquarters Homeland Security, established in January 2002, has 500 personnel assigned to NORTHCOM, but remains stationed in Norfolk, Virginia. It coordinates the land and maritime defense of the continental U.S. as well as military assistance to civil authorities." Marti Hiken, "Military Reorganization: NORTHCOM - The New Designer Military," Guild Practicioner, a publication of the National Lawyers Guild (Volume 59, Number 4, Fall 2002).